If nearly 34% of American adults and 17% of kids had emphysema or heart disease, we'd hardly consider it a cause for celebration. But an announcement on Wednesday that that same share of us now qualify as obese  and that a whopping 68% of adults and 32% of kids are at least overweight  is being hailed as encouraging news. Why? Because the numbers aren't even higher. The U.S. is easily among the fattest places on the earth  a distinction we've held for more than 20 years now  and it's no surprise as to how we got this way. Our cars, computers and 40-in. TVs have all conspired to take the physical exercise out of our lives and replace it with round-the-clock sitting. Combine sedentary living with cheap food and supersize portions (the U.S. now produces enough food every day for each of us to consume 3,800 calories, never mind that we need only about 2,350 for a healthy diet), and there was no place for the needle on the scale to go but up. Now, according to a study just released by the Journal of the American Medical Association, our long national binge may at last be coming to an end. The new study was actually two studies, both conducted by the Centers for Disease Control and Prevention (CDC). The first one, which focused on adults, surveyed 5,555 men and women age 20 and older, using their height and weight measurements to calculate what's known as body mass index (BMI). In general, people with a BMI of 25 to 29.9 are considered overweight, and those with a 30 or higher are obese. Previous surveys had tracked a steady growth in national BMI from 1976 to 1980, 1988 to 1994, and again from 1999 to 2000. But this study  which spans the period from 2000 to 2008  showed no significant change. The burden of the weight gain that was documented in those other studies is not being borne evenly. 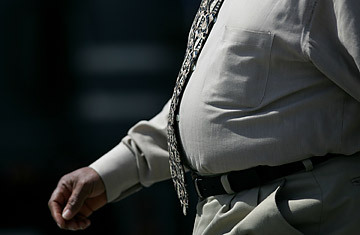 Over 72% of men are overweight, compared with just over 64% of women. Yet women are worse off in the obesity category  35.5%, compared with 32.2% for men. Ethnicity makes a difference too  sometimes a big one. The least obese women are non-Hispanic whites, at 33%; the worst-off are non-Hispanic blacks, at 49.6%. Among men, the range is smaller, from 31.9% for whites to 37.3% for blacks. But what all the groups share is that the worst of the gaining appears to be over. "This was encouraging to see," says CDC obesity expert Dr. Bill Dietz. "The results don't mean we've beaten the epidemic, but they do suggest we've stopped the progression." For kids, the signs are even more encouraging, partly because the trend up until now had been flat-out scary, with obesity rates tripling among school-age children since 1980. The CDC's new study looked at 3,281 subjects in the 2-to-19 age group and 719 subjects in the birth-to-2-years group and found that obesity rates have settled in at 9.5% for infants and toddlers and at 16.9% for 2-to-19-year-olds but have not been climbing. The only kids whose condition deteriorated further were those who were considered extremely obese  at or above the 97th percentile for weight. In most cases, these children were white and male. "These are the heaviest boys who are shifting even further out," says CDC epidemiologist Cynthia Ogden, the lead author on the paper. "We didn't see that among the other kids, and we don't have an explanation for it yet." This one group of dangerously obese outliers is not the only thing that makes the twin studies something other than unalloyed good news. More worrisome is the possibility that the national weight plateau is not the result of Americans' finally getting the message about diet and fitness but the fact that we've simply reached some kind of obesity saturation point, with nearly all people who are genetically susceptible to gaining too much weight already having done so. If that's true, it could mean that a plateau is the best we can hope for and that the next step  the trip down the other side of the weight mountain  will never happen. "That's an up-in-the-air question now," concedes Ogden. Dietz is a bit more optimistic, saying the saturation theory does not hold up because children and adults have plateaued at such different points. "You can't argue that adults will saturate at one rate and kids at half that rate," he says. For now, weight experts are choosing to interpret the numbers in the most hopeful way, saying public-education campaigns are working and that now is the time to double down on them. "The one thing that was most responsible for the drop in the per capita tobacco use in the U.S. was public awareness," says Dietz. "That may be happening with obesity now." America's health  to say nothing of its waistline  may depend on that being true. See a special report on the science of appetite.